The landmark Supreme Court decision, Roe v. Wade, turned 41 years old Wednesday. 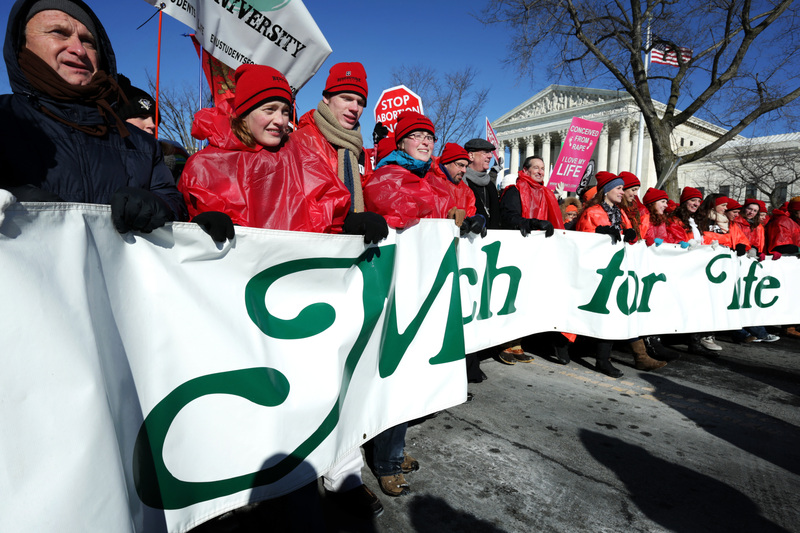 Each year, on the anniversary of the legal foundation of abortion rights, the anti-abortion squad holds an annual March for Life rally in Washington. And now that the ruling has reached middle age, it might come as a surprise that two of the women at the forefront of the anti-abortion fight are only in their twenties. Profiled in the Washington Post's Style section, Kristan Hawkins, 28, and Lila Rose, 25, have been described as leaders of the resurgence of the pro-life movement. As an ideology that has often been represented in the media by the bumbling statements of older white men — Todd Akin and Trent Franks, anyone? — Hawkins and Rose represent a big shift. Hawkins describes herself as an “abortion abolitionist," and has drawn comparisons between her work and the fight against slavery in the 1800s. She's president of Students for Life of America, which bills itself as the largest youth pro-life organization in the country. When Hawkins was just 15, she started volunteering at a pregnancy help center in Steubenville, Ohio, counseling women not to get abortions. Since she took the helm of Students for Life in 2006, the organization has grown from 180 chapters on college campuses to 780. Hawkins is a very active Twitter user and outspoken commenter on national television, supporting pro-life ideals (like the contested belief that fetuses can feel pain) and railing against Obamacare. Lila Rose, who founded the organization Live Action when she was 15 years old, relies on a different sort of tactic to get her ideas out there: She sneaks hidden cameras into Planned Parenthood clinics. Rose got her start in the world of undercover video recording with James O'Keefe — whose heavily edited hidden camera footage led to the defunding of liberal political organizing group ACORN — when they secretly filmed a college health center nurse encouraging a "pregnant" Rose to have an abortion. Rose also exposed Planned Parenthood center staff for pushing her to give false birth dates and ages so that police didn't have to be involved. Planned Parenthood has called her actions "unethical." In 2008, she raised about $45,000 from council donors to take her undercover stings to several states. She bleached her hair, wore glasses, put on Hannah Montana shoes, and pretended to be 15 and involved in a relationship with an older man.